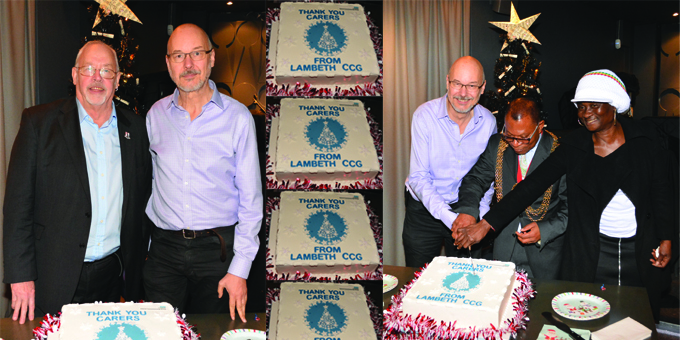 Carers Hub Lambeth welcomed carers to a winter celebration at the Hideaway Bar in Streatham. Carers enjoyed a quiz, lunch and raffle with prizes coming from donors including Hideaway, the Manor Arms, the Earl Ferrers Pub and Lambeth Council, with a special cake from NHS Lambeth Clinical Commissioning Group, CCG. The Mayor of Lambeth, Councillor Donatus Anyanwu gave a speech praising carers in the borough, who he called ‘stars’ who work while many council staff are sleeping. He is pictured with a star carer and Adrian McLachlan, Chair of the CCG who also thanked carers at the event. Adrian is also pictured with Robert Hill, Learning Disabilities Carers’ Advice, Support & Development Worker, Lambeth Mencap. Visit http://carershub.org.uk/advice/newsletter to sign up to the Carers Hub email list where future events will be publicised.